Glen Scotia Double Cask fits with its maritime origins: a lot of iodine taste and a large complexity as well with fruity, vanilla and roasted aromas due to its successive aging in oak, Bourbon and Sherry casks. 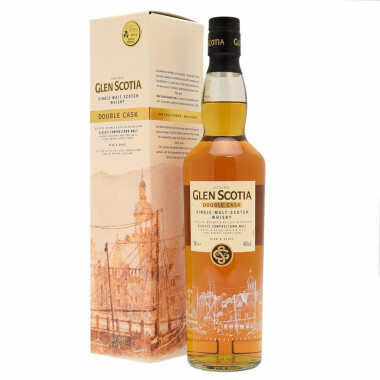 Glen Scotia Double Cask comes from Campbeltown at the tip of the Kintyre Peninsula. In this region of Scotland, whiskies are original, most often characterized by their flavors with maritime influences. The Glen Scotia Double Cask features this iodized style. Aged in oak barrels then refined in Bourbon barrels and finished in Sherry Pedro Ximenez barrels, it perfectly balances between maritime notes and the richness of its aromas of dried fruit, vanilla and roasted oak. Glen Scotia distillery was created in 1832 by the Galbraith family. It's one of the last distilleries with Springbank remaining in Campeltown. It is told that Glen Scotia distillery is hanted. Duncan MacCallum's ghost, an ancien owner, killed himself in december 23rd 1930 drowning in the Crosshill's Loch. At the end of the 20th century, the distillery closed several times and the activity has sporadic. The distillery was bought byLoch Lomond. With a new fresh style Glen Scotia whisky is splendide. The distillery was rewarded with several flattering reviews, like James Darwen's four stars in the whisky guide. Important dates : the distillery was founded in 1832 by the Balbraith family, it is sold at the "West Highland Malt Distillers" in 1919 but bankrupts in 1924 and the distillery passes under Duncan MacCallum's supervision. In 1928, it closes after Duncan MacCallam's suicide in december 23rd 1930. The Glen Scotia whisky production starts again in 1933. In 1954, the distillery is bought by the company Hiram Walker, who sells it then to A.Gillies and Co a year later. In 1970, Glen Scotia belongs to "Amagamated Distillers Products" after A.Gillies and Co absorption. Gen Scotia closes in 1984 before oppening again in 1989 when the company is bought by "Gibson International". The production stops again in 1994 when the distillery was taken by Glen Catrine Bonded Warehouse Ltd. In 2000, Loch Lomond distillery places his workers at Glen Scotia and got the activity back on track. Nose: sweet and powerful,with notes of caramelized fruits, of apple and peach. Palate: smooth and full-bodied at first, then reveals the dry and powerful style typical of the distillery. Finish: long, with hints of black fruits.